Transatomic has published a white paper on its website that describes the results of a six month study in cooperation with Burns & Roe, a firm that has experience in engineering and constructing nuclear power plants. It’s probably the approach of this engineering firm that gives the TAP project a pleasantly practical ‘feel’ compared to some other proposed reactors described on daretothink. Also, the transatomic white paper gives a welcome load of details about how the reactor might be embedded in the global structure of a power plant. 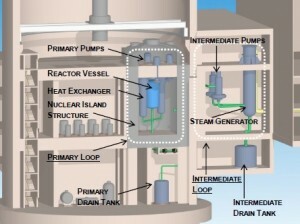 An example is the ‘nuclear island structure’, a reinforced section in the middle of the larger surrounding building in the center of the designed power plant. This picture, clearly the product of a thinking process that went well beyond the challenges of the reactor physics, causes the whole concept to get a more realistic ‘feel’. Also, the description pays attention to past historical developments, thus explaining choices that have led to this particular design. The TAP reactor has a lot of interesting features. Transatomic claims that the design greatly improves the molten salt reactor concept, while retaining the significant safety benefits. Probably, but the same can be said about the German Dual Fluid Reactor and the Canadian Integral Molten Salt Reactor. A TAP feature shared by both the DFR and the IMSR is the absence of the use of beryllium as a component of the salt mixture – according to many commenters, an important difference with reactors that need this highly toxic element. However, the TAP reactor does have some interesting features of its own. The most important being its zirconium hydride moderator. This combines the low neutron absorption and high radiation resistance of zirconium with the excellent moderating qualities of hydrogen. The moderator makes the TAP a thermal spectrum reactor. Here, the paper makes a mayor point that has also been made by LeBlanc in his articles: the molten salt reactor does away with the common wisdom that tells us that only fast reactors can effectively burn Spent Nuclear Fuel (SNF). It used to be the catch 22: to burn SNF, you need a fast reactor, but the fast neutrons in a fast reactor also attack the structural material of the reactor, making fast reactors a headache to build. However, since the fuel of a molten salt reactor is a liquid, fission products that would have spoiled the chain reaction in solid fuel, can easily be removed. Therefore, the fuel can remain in the nuclear core as long as is necessary to consume all of it. In other words: the molten salt adds the factor ‘time’ to the thermal spectrum neutrons – the time necessary to consume the nasty elements that we know from Spent Nuclear Fuel, regardless of whether these elements were produced in TAP itself or coming from existing stockpiles of SNF. The beauty of it is that burning SNF simply means producing energy: a liability turns into an asset.